My third grade classes this year have challenged me to try new interventions – whole class, small group, and individually. They are spirited to say the least, chatty, opinionated, and many of them have difficulty taking direction. As fun as they can be, they also cause their fair share of conflicts. Many of them will cry and tell when someone is mean to them, but won’t own up when they do the same mean thing to someone else. I want to share one whole class intervention I tried with them a few weeks ago. This is my “keep in my back pocket” lesson that I pull out when nothing else seems to work. -Someone give a mean look. -Someone tell a secret about you. -Someone share a secret of yours and break your trust. -Someone tell you that you can’t play. -Someone tell you that you can’t sit next to them. -Someone call you a mean name. -Someone make fun of you. -Someone laugh along when someone is making fun of you. For each mean thing I read off, there were multiple hands in the air. I heard comments such as, “That happens to me a lot” and “I see others doing that.” After I read all of them, I told my third graders that all of these mean things are things that I see and hear happening in our community and it’s not okay. Then, I introduced my friend. I hung up a life-size cutout of a person. I told them I was going to show them how hurtful their mean behaviors can be to someone. As I read each mean thing again, starting with “Every time YOU….” I cut off a part of the person and let it fall to the floor. The first time I cut a piece off, you should have heard their gasps. A few of the boys got very silly about it (their usual), so I gave them my stern “take this seriously or else” speech, and we were good to go for the rest. Once we had only a head and shoulders left, I told them we needed to rebuild my friend with kindness. I asked for ideas of how we could help my friend feel better. For each kind idea they shared, I taped a piece of the person back on. Then, we talked about how the kind acts helped a lot, but the person doesn’t quite look the same as before. There are scars. Scars from mean words and mean actions. My third graders told me that when someone is mean to you, you remember it, even after they’ve apologized. My friend with scars all over his body showed us how we can feel on the inside when someone is mean to us. While the meanness hasn’t ceased completely, the visual left its mark on my students. I hung up my scarred friend in my room for reminders to be nice, because no one likes to feel all cut up. If you say the words “girl drama” or “girl problems” right now, I will run away and hide. Forever. You probably know exactly how I feel. Especially if you’re a School Counselor who is sent the teary-eyed little girls who can’t seem to break the mean streak. I’m deep in the trenches of 3rd grade girls who request to see me and want to tell me everything that they’re so-called friend(s) did and said. The faces. The eyes. The talking behind the back. The taking friends away. The running away. The “spying.” The mean and the not-so-mean words. Well, I had heard enough. I decided to host an intervention. I invited (actually, I made them come, but whatever) all girls involved in the ongoing problems in any sort of way. I set up in a classroom and they brought their lunches. 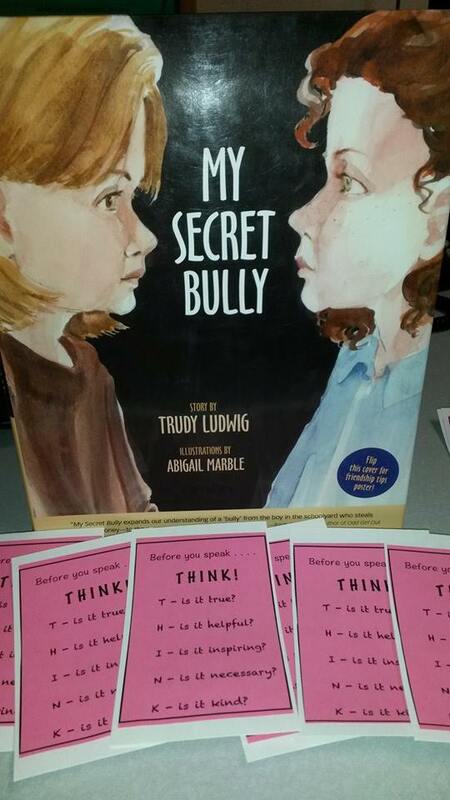 Then, I gave them each a “Think before you speak” card to help remind them of the words they use. I was really prepared and I was really hopeful. The thing about interventions is that they don’t always work. Sometimes the people you’re doing the intervention for don’t want to change or don’t see the problem. Well, my intervention was a big, fat failure. And, I really knew the intervention had failed when the very next day, three girls filled out separate slips to see the counselor, and when I pulled them all together to talk, they told me the problem was they thought one of the girls had called another one of the girls a “turd” at recess. No, I’m not even kidding. I had pulled them from class so they could tell me someone might have said the word “turd.” I almost told them to get out of my room. Instead, I created this Problem Solving Report. From now on, when they feel the need to run to me and complain about things they aren’t willing to change, they will fill out a Problem Solving Report on their own time – recess. No more class time. When they fill one out, they will turn it into me and when I have time to read them over, I will decide if it needs to be processed further or not. The report takes pieces from Dialectical Behavioral Therapy (DBT) to help them develop the skills they need to handle their own problems AND see their own part in it. So far, no reports have been filled out. I guess the girls have decided that none of the problems are “big” enough to report anymore! Anybody who works in a school setting probably knows that the word “bullying” is a buzz word as of late. Bullying is a hot topic and it gets a lot of attention. For me, bullying sometimes feels like a dark cloud looming over my head, as I wait for the next time it will come pouring down on me. The cloud opens up every time students use the word to describe a friendship conflict in which their feelings were hurt, or every time a parent uses the word to defend their child’s actions. Sometimes, I get so sick of the word that I don’t even want to teach it to my students, because I know it will result in the inevitable and annoying overuse. Of course I do teach about it, because it IS an important topic. At my school, the excessive use of the word bullying hits overdrive as spring gets sprung. Friendships are breaking and mending naturally and repeatedly, and with this comes some mean behaviors. I spend a lot of time each spring helping students use the problem solving skills they already possess (and just need to be reminded they have). I say all of this to say my next point – because spring is here, I’ve been thinking about bullying as a bigger issue than student-to-student relations; I’ve been thinking about it as a school-wide community issue, a climate issue, a global issue. We all know that bullying is not just a childhood problem – adults can bully too. Sadly, the students who struggle with bullying behaviors sometimes have parents or adults in their lives who struggle with it too. Sometimes, students can even bully the adults in their lives. Sometimes, the target of the bullying is the teacher. I have seen it happen. Let’s journey back to the year 1998-1999. I was in seventh grade, on a team mixed with eighth graders. The year I started in middle school, a new young teacher began teaching social studies. He was obviously nervous as he found his way around a classroom filled with hormonal adolescents. What most students noticed about him right away was a peculiar speech impediment – he finished most sentences with “mmkay” (kind of like Mr. Mackey, the school counselor on the adult cartoon South Park). During some class lectures, you’d hear “mmkay” a few dozen times. Needless to say, it got old. Really fast. As you can imagine, the speech impediment became a topic of conversation and jokes for the eighth graders, which the seventh graders overheard and joined in on. Eventually, the jokes happened less behind the teacher’s back and more often to his face. I remember students interrupting his lectures to mimic his words. I never mimicked his “mmkay,” but I laughed along when others did. I was a bystander to the bullying of this new teacher. Well, the teacher ignored the bullying for a while, until he couldn’t any longer. I was waiting for him to blow up, discipline the students, up and quit. He didn’t. Instead, he did something so special and so brave, that it worked. I remember the social studies class that day. The teacher wasn’t standing at the board; he was sitting at a desk just as we were. He opened the discussion by telling us that he wanted to share something with us. Then he told us all about this speech impediment – he talked openly about it with us. He said it was something he struggled with for a long time, and that we weren’t the only ones who have noticed it and mimicked it. He said he had tried years of speech therapy to stop, but that it was a habit and it’s hard to stop. He ended his speech by sharing that he wanted to be our teacher and he wanted the classroom to be a cool place to learn cool stuff, and that he needed everyone to feel comfortable being there, including him. He didn’t tell us to stop or threaten to send us to the office if we didn’t. He just put himself out there, openly and honestly, so that we could see how our actions affected him and others in the classroom. The students started to see him differently – he wasn’t just a teacher; he was a person with feelings, just like us. Seeing him put forth this effort changed the climate in this classroom from then on. After that day, students stopped mimicking him. A few would make jokes behind his back, but those jokes soon sizzled out because no one found it funny anymore. Thinking back on this experience, I realize how grand a gesture it was for this new teacher to open up his world to a group of awkward adolescents who needed a lesson in compassion. I commend him for his strength and courage to put his hurt feelings aside and use his struggle to teach us something more important than the curriculum that day. I don’t remember much from seventh grade social studies, but I do remember this lesson in empathy, humanity, and kindness. As we each go forth and work with students, we may find ourselves mistreated, unappreciated, and maybe even bullied. I hope we can understand that these students need unconditional care regardless of their actions because they may be trying to push people away. I hope we can understand that these students may need a lesson in compassion because they may not get it anywhere else in their lives. I hope we can use their actions for teachable moments. If we can do this, there will be more allies coming together than targets of bullying coming apart. It is easier said than done. We need to do it anyway. Every day. The cover of the first book in the series. This year, while planning my bullying unit, I couldn’t wait to use the 3-part “Weird” series by Erin Frankel. This post is about those amazing books and the lessons that came out of them. Originally found on Vanessa’s blog, the Savvy School Counselor, I created some lesson materials to follow reading each book with my 3rd and 4th grade friends. What I love about these books is that they are a series – my students were intrigued by the first page in “Weird” and wanted to read them all in one day! They loved that the same characters were in each book and that they got to learn more about each every time we read together. From a School Counselor’s stand point, I am pleased that each story shares insight into bullying from different points of view. 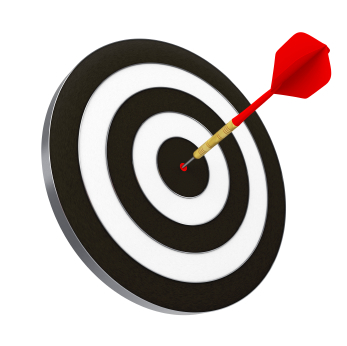 “Weird” is from Luisa’s perspective (the target), “Dare” is from Jayla’s perspective (the bystander, and as we come to learn, also a target and a bully at times), and finally, “Tough” is from Sam’s perspective (the child doing the bullying, who has also experienced bullying herself). I felt that by reading the entire series, my students gained a lot from hearing all sides of bullying and how it affects everyone in the school, teachers included. Another amazing thing about these books is they each come with discussion questions and activity ideas in the back. I created documents for activities that I used (you can get access to each document by clicking on the title). Weird Activity – I ended up using my school’s die-cut machine to make hundreds of polka dots for this activity. Each student got 3 plain white dots and wrote negative thoughts that Luisa had in the book, or they could use their own (for example, “I’m weird” or “No one likes me”). Next, each student got 3 colorful dots and wrote positive thoughts that Luisa had or their own (for example, “I’m unique” or “I’m proud of myself”). Then, we all gathered around the recycling bin, crumpled our negative thoughts, and threw them in. We discussed how we can recycle our negative thoughts into positive and how that can make us feel good. Many students chose to share some of their positive thoughts with the class, and some used their colorful dots to decorate their notebooks. The students really enjoyed doing this! Dare Activity – the second book is all about bystanders and upstanders. So this activity page gave students practice with what they might say if they see someone being bullied. We discussed that Jayla had to prepare herself so she felt ready to handle bullying, and that’s why we practiced coming up with our own words to be an upstander. At the end, many students read their words aloud to the class. Tough Activity – a huge part of the third book was about Sam learning why she was acting mean and how she could get what she wanted without hurting others. So, my students used Sam’s behavior in the book to fill out the worksheet. We discussed in length how she was acting tough so she could feel in control, but was actually causing more problems for herself and others by doing it that way, and learned that it felt better to be kind. Although this was one activity suggested in the back of the book, I’d like to do something different next time because this one was lengthy and many students needed help to complete it. I’m thinking of doing something with hearts and kindness…still thinking! One last thought – although my 3rd graders absolutely loved the series, I’d recommend saving the books for when they’re in 4th grade. In my experience, my 4th graders seemed to have greater insight and understanding into the characters and got a lot more out of the follow-up activities. 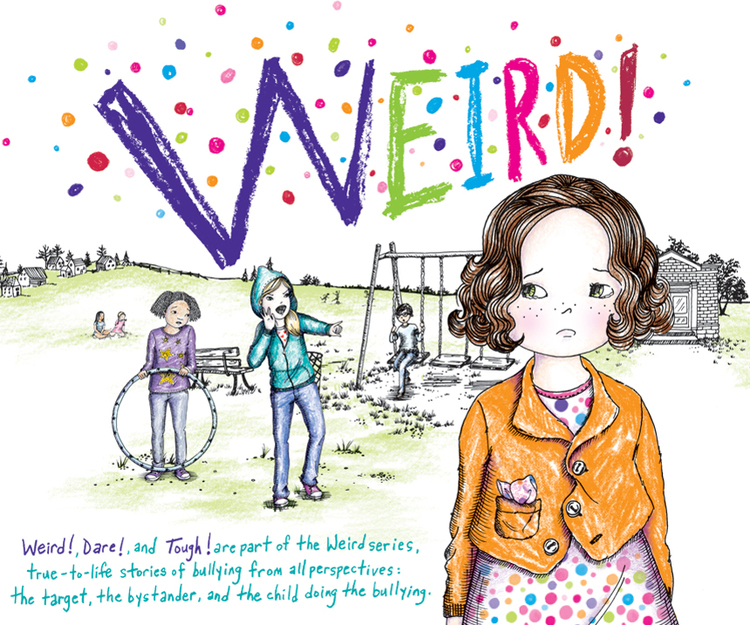 I think the “Weird” series will become my 4th grade bullying unit from now on!